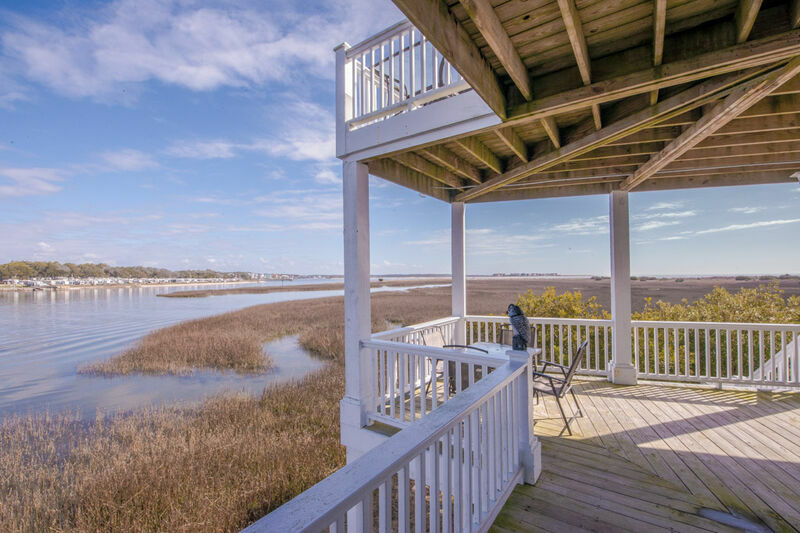 Sweeping 270 degree water views of Intracoastal, Shallotte Inlet and the Atlantic Ocean to be enjoyed from this 2 bedroom, 2 bath lower level apartment. It is ideal location for a couple, two couples, a few friends, golfing buddies, beach lovers or a small family during the Value and Off rental seasons ONLY, September through May. Snowbirds also welcome for monthly rentals late September through March. The master has a king bed and a shared bathroom. The second bedroom has a single and double bed. This bedroom can use the full hall bath right across from it. A full size kitchen and eat in area along with an expansive living area make a perfect place for a small family. Baywatch has something for everyone! Each bedroom has its own television and the living area has a large screen TV and DVD player. Wireless Internet. Board games and puzzles are available. On ground level there is a ping pong table and foosball that can be lighted for night games as well. Relax in a hammock (2). Maritime Place community amenities include a dock for small boats at high tide and a community pool just across the cul-de-sac from the house. There is also a fishing pier close by and it is an easy 6 minute walk to the beach on a well maintained path. Renter will have use of community boat dock for loading and unloading passengers during high tide only. Boats can be launched from the public access at the OIB bridge. Boats with trailer can be parked on the rental property. Overnight docking at the floating dock is not permissible. A fixed dock is available for overnight docking, but depth of slip is not guaranteed.